But then a few enthusiasts began to question why? Now people flock to see the re-born steam engines go by. From all the hoots and whistles they hear the engines cry. And out come all the cameras when a steam train passes by. There’s always a photographer when steam trains whistle by. And water which will make the steam to haul it up the track. But just now, from my window, I saw a funny sight. I had to do a double take, it didn’t seem quite right. Like old men in a marathon, all breathless but resigned. Racing madly North, like a mechanical hellcat. Refusing to believe that two of them had broken down. And then, a minute later, I heard the Scotch express. But just to keep one step ahead, only three would do. bringing the day to attention. guerrilla raids from the town hall roof. seizing the freshest fruits of the day. across the cobbles, on missions of their own. any pigeon not trained to dodge. to acquire before the evening’s foray. Illusions still intact, unlike their booty. better prepared for the next offensive. Picking flowers, varied, and wild. Remembering the poem, ‘Ducks Ditty’. We’d enjoy a crafty smoke. And must go down to the river again. wrinkles deep and hair grey. You’re a bit of sage. It’s a blessing is age. You’re a bit of a sage. catch a bus and never pay. Recalling, that very first kiss. When, you set off for the loo. Five white mice, and a rat. And to me, a perfect wife. Will our kids be able to say the same? On their journey, through married life. Could not bear to close its eyes. That’s too far-fetched, now in’it? And I don’t believe it, for one minute. And thought they had us down, for mugs. Where poems were discussed and scanned. Their verses; make the mountains ring. Kissing trees and blessing flowers. A few fell-walkers showed their skill. Where shining Esthwaite Water lay. Under a sky of azure hue. Just rustling leaf and whistling bird. Like giants holding up the sky. That men should climb because they’re there. Nor do they care for poets’ rhymes. Such homage to its majesty? Our writer’s group coordinator Kevin Murphy led the morning Poetry Writing Workshop under the title “Substance over Style” using examples from prolific local poets Pamela Mann and Pete Brammer. Retford was then proud to welcome internationally successful crime writer, Nottingham’s John Harvey to share his latest selection of poetry old and new ‘Out of Silence’. 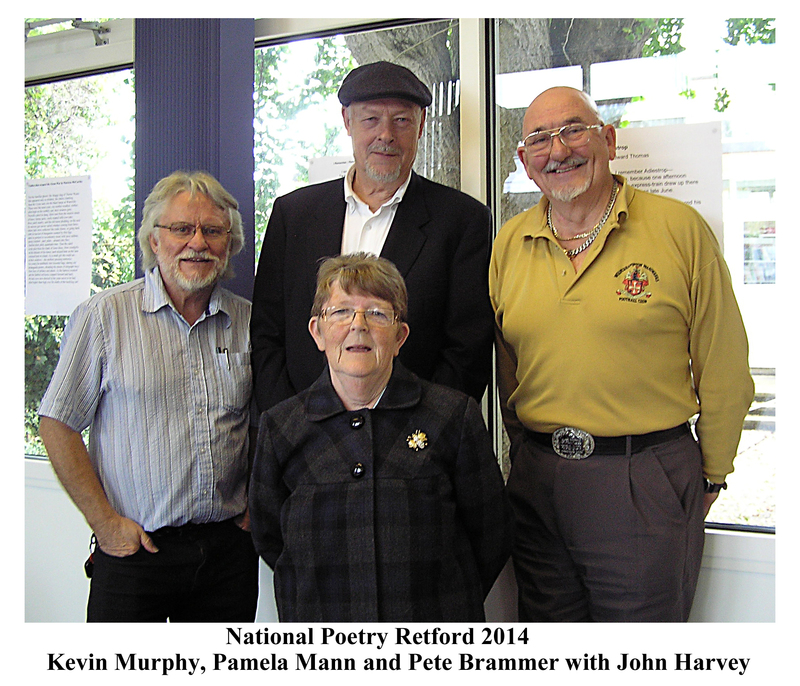 A selection of Pam and Pete’s poetry is uploaded under the ‘National Poetry Day’ category.